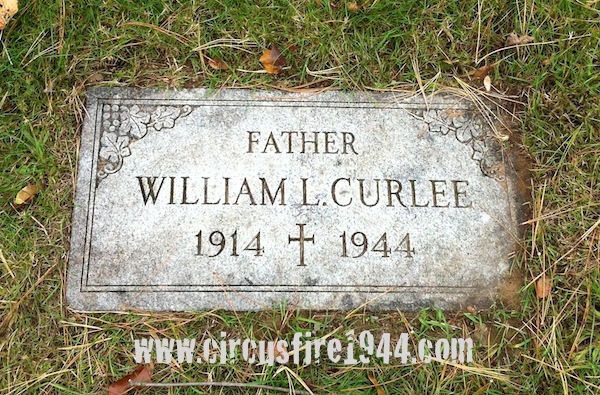 William "Will" Lee Curlee Jr. of 114 East 208th Street, Euclid, Ohio was born September 26, 1914 in Morganton, North Carolina, son of Mary (Holloway) and William Lee Curlee, Sr. 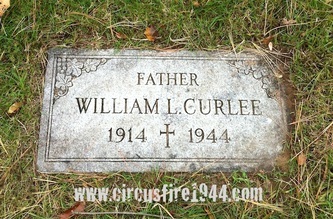 He was found dead at the circus grounds after the fire on July 6 at 2:45 pm, and was buried at Mt. 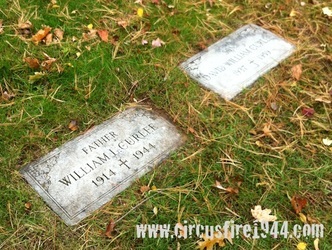 St. Benedict Cemetery in Bloomfield after services at Dillon's Funeral Home. 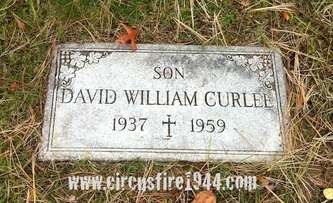 Mr. Curlee leaves his wife Mrs. Doris (Cadoret) Curlee and their 8-year-old son, David W. Curlee; his parents, of Hartford, and four sisters: Miss Mary "Dolly" Curlee, 27; Miss Frances Curlee, 24; Miss Barbara Curlee, 19; and Miss Norma Curlee, 16. 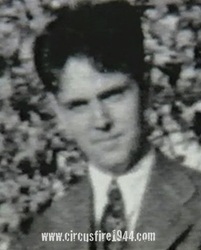 Body #4588 was identified as William Lee Curlee Jr. at the State Armory on July 6 by Ernest Perry. Mr. Curlee was a former Hartford resident and worked as an inspector in the aircraft industry. 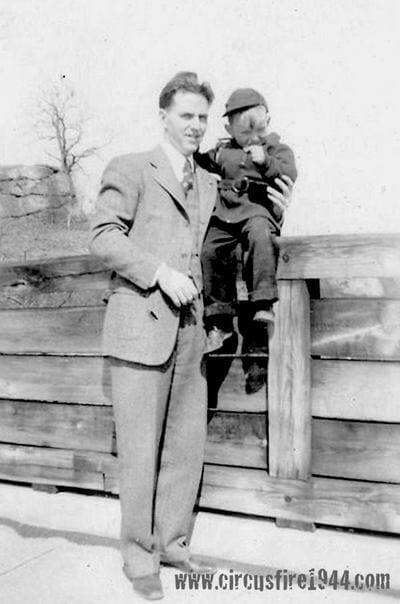 He had been assigned to the Eaton Mfg. Co. in Cleveland, and was vacationing with his family and his wife's parents at 65 Sherbrooke Avenue, Hartford, when the circus fire claimed his life. William and his son David initially escaped from the big top; Will instructed his son to wait for him by the car and he went back inside to help others in need. 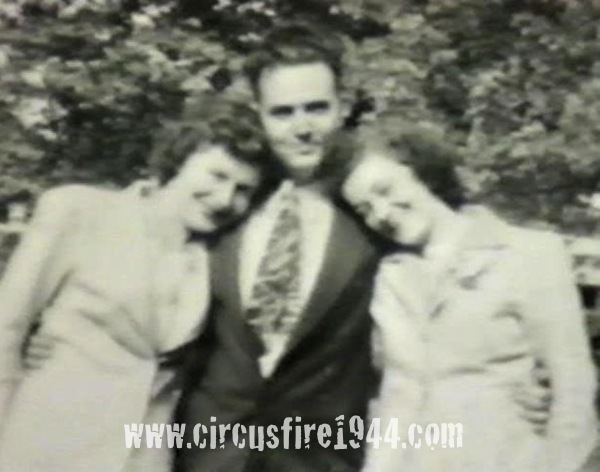 Witnesses reported that William was helping people over the animal chutes when the canvas roof and supporting pole collapsed on him. His estate was awarded $15,000 by the arbitration board. 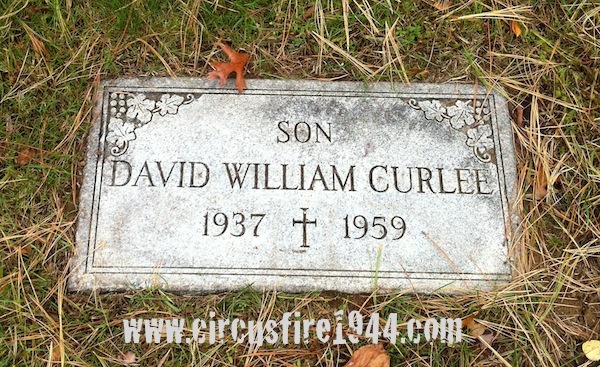 The Curlee family faced tragedy again in 1959 when Bill's son David, then 22, was fatally injured when a car he was riding in left the road and struck a tree near Provincetown, Massachusetts.